Some adoptive families find that adopting a child can put a strain on family finances, so many families rely on the federal adoption tax credit to help offset some of their adoption expenses. 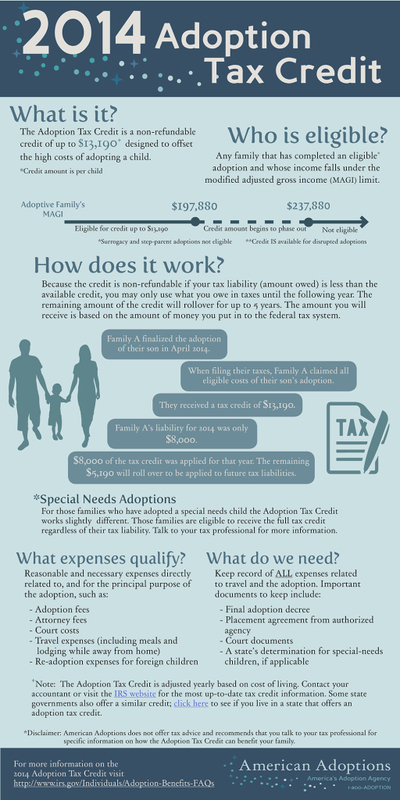 The Federal Adoption Tax Credit can help some families offset costs for qualifying adoption expenses. The adoption credit is not refundable, which means that only those individuals with tax liability (taxes owed) will benefit. The maximum adoption tax credit for 2014 is $13,190. The adoption tax credit income limit is based on modified adjusted gross income (MAGI) and is recalculated each year based on current cost of living. For the 2014 Adoption Tax Credit, the maximum amount available will begin to phase out for families with MAGI above $197,880 and will be unavailable to families with incomes around $237,880 or above. For more information on the adoption tax credit and exclusion, read 2014 Adoption Tax Credit or visit www.irs.gov. American Adoptions recommends that you contact a local accountant or qualified tax professional for more specific information for your family. Read how American Adoptions helps you adopt within your budget. You can also speak with an Adoption Specialist at 1-800-ADOPTION with any questions about cost and financing. Attention Waiting Families: Just a quick reminder to current families, who are active and waiting for placement: Send us the front page of your federal tax return after completion at the end of the fiscal year because we always need the most current copy of these on file! Interested in finding out all the information on adoption and the needs along with qualifications. What’s the steps that has to taking? Hi Tim and Michelle, please give us a call at 1-800-ADOPTION for more information! Thanks!